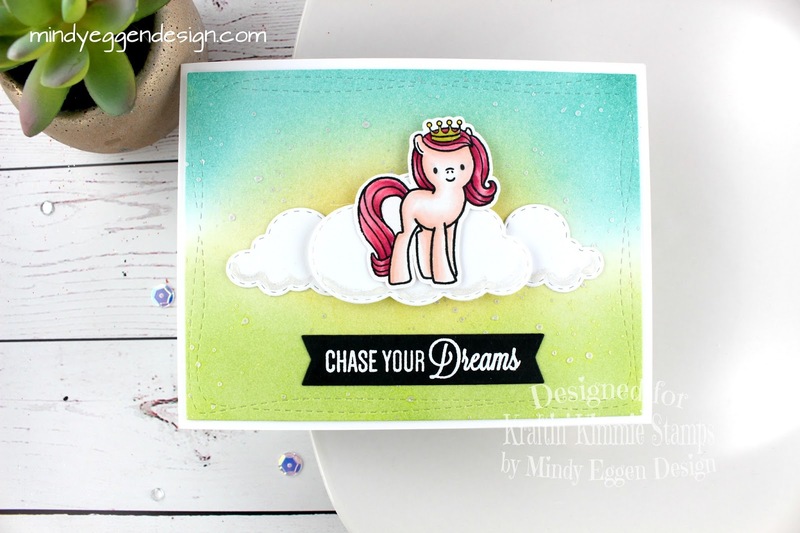 Welcome back everyone to another challenge with Kraftin Kimmie Stamps! Today’s challenge is grass and I have a little story to mine…. I also have a colouring/card process video for my card today that you’ll be able to view later today. I start out my card using a 4 ” x 5 1/4″ panel of Bristil Smooth cardstock. I am trying out some new ink pads I recently received by Catherine Pooler. I heard you could ink blend with them so I wanted to give it a shot. My thought was to have a unicorn on a grassy hill. So I started with Lime Rickey ink and started blending on one end of the card. This is a really bright green and it does ink blend wonderfully. I blended to about the middle of the card and then started on the other end with Aquatini for the sky. I left a little gap in the middle and finished it off with a little bit of Tiara in the middle. I scooped some Perfect Pearls onto my craft mat, added a little water and then using an acrylic block, flicked that mixture onto my background. So far so good. Next, I colored up my image. I stamped this unicorn from the Unicorn & Rainbows stamp set onto Neenah white cardstock using MFT Extreme Black Ink. Then colored with my copic markers. I don’t do light colors very often and was giving it a shot with a light pink body and dark pink mane and tail. Then I cut it out with my Scan n Cut. At this point, I shut my camera off to think about how I wanted to add my unicorn to a grassy hill. 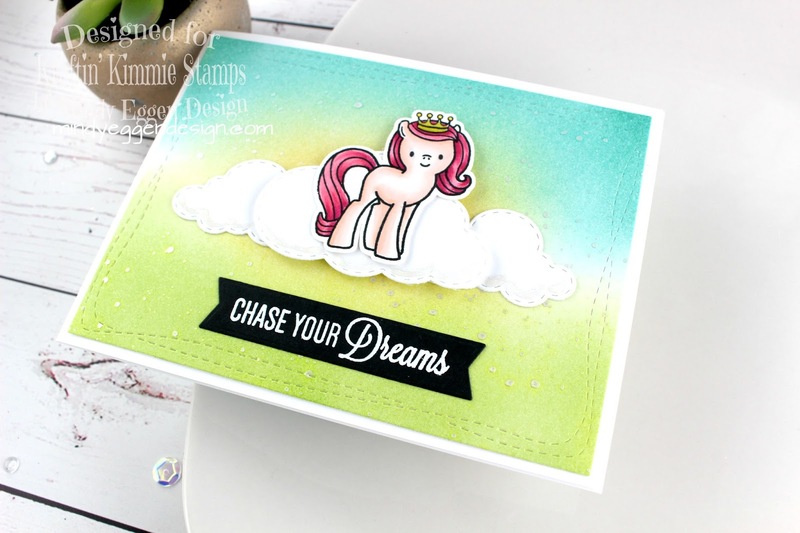 I wanted to put the unicorn on something to anchor it to the card and for some reason clouds popped into my head. So, I diecut a few stitched clouds from white cardstock, flipped the camera back on and started creating. I also ran this ink blended panel through my Big Shot machine using the Wonky Rectangles die. I’ve been itching to get my hands on this die as I love that stitched look around it! From here I started putting my card together adding the clouds to the middle of the card with the middle one popped up with foam squares and then attaching the unicorn to the middle. I finished off the card by adding a sentiment that I heat embossed onto black cardstock with white embossing power and die cut from a Banner die. To finish off the card, I added some Nuvo Glitter pen over the cloud bottom and topped it off with Nuvo Toni Crystal Glaze. Now, looking at this I was really happy. I loved the colors and the sentiment. I was taking pictures of my card when all the sudden it hit me – this doesn’t look like grass haha. This just looks like a cool background all because I added those clouds. So, you CAN create grass using ink blending, unfortunately, that’s not what my card looks like. It kind of took on a life of its own. I still hope this inspired you to try ink blending for a grassy bottom to your card. Create a card, scrapbook page, altered item etc. with some GRASS and submit your design for your chance to WIN! You have until Friday, March 2nd to enter this challenge! Keep in mind, all entries are welcome but you must use a Kraftin’ Kimmie Stamp in order to win.